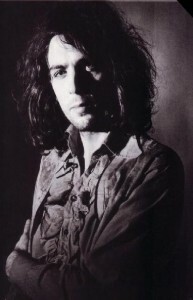 Syd Barrett was a founding member and original lead singer of the progressive rock band Pink Floyd. He left the group in 1968 amid speculation of mental illness in the context of heavy drug use. When he died in 2006 he had not appeared or spoken in public since the mid-nineteen seventies. There are many accounts of Barrett’s bizarre behaviour before his withdrawal from public life, although these were often related by people who were themselves intoxicated at the time. At one stage R. D. Laing was reportedly approached for advice; on hearing a tape of a Barrett conversation, Laing declared him “incurable”. After leaving the band one of Barrett’s final meetings with the remaining members of Pink Floyd was when he appeared at a recording session in 1975. By coincidence the band were recording a song about him. He had put on much weight and had shaved his hair and eyebrows and at first he was not recognized. Whether or not Barrett suffered from an enduring mental disorder is in question. Barrett’s sister Rosemary when speaking to Barrett’s biographer was adamant that Barrett had not received treatment for mental illness during the previous 25 years and did not have a mental disorder. There is an exhibition of Barrett’s artwork and letters at the Idea Generation gallery from 18 March until 10 April. It is hard to imagine how someone with any level of mental illness could also live as a recluse in the English countryside for almost 30 years. He certainly managed well without any medical treatment. Most likely the media just frustrated at his refusal to do interviews so decided it was better to run with the story that he was simply crazy. If he was a bit crazy, it was probably no more crazy than the average person that took a few too many strange substances in their youth.